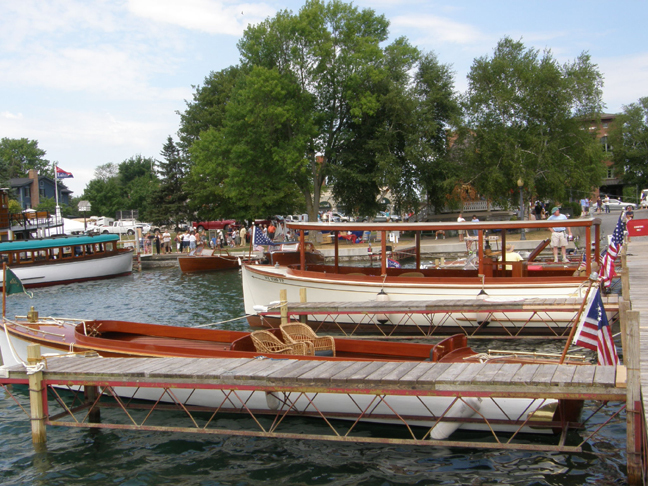 The Finger Lakes Chapter invites you to be part of its 34th Annual Antique and Classic Boat Show in Skaneateles, NY. The Show’s setting is along the village pier and in lakeside Clift Park at the north end of 16-mile-long Skaneateles Lake, one of the most beautiful in Central New York’s Finger Lakes Region. The show is a judged event with unique awards in several categories following the ACBS Two-track Judging System. Excellent docks can accommodate 44 boats along the village pier, and another 40 boats can be easily located in the adjacent park as on-land displays. Its tree-shaded lawns provide a perfect setting for land displays of watercraft and nautical exhibits. Between the pier and the park is a convenient walk-in ramp for launch and retrieval of small craft. Two miles down the lake is an excellent state launch (no launch fee) where FLC crews standby to assist with the launch and reloading process. A hallmark of the Skaneateles Boat Show is complimentary valet parking of trailers and tow vehicles so that after launching, exhibitors need only concern themselves with a pleasant boat ride up the lake to the Boat Show venue. Similarly, tow-vehicles and trailers can be taken to the launch for reloading of boats after the Boat Show. Skaneateles is a picturesque and historic village founded in 1833. Today, it boasts excellent restaurants, enticing boutiques and shops, and beautifully restored and maintained homes on tree-lined streets. Concerts in the park, children’s activities, and narrated riding tours of the village are also part of this festive weekend. All that’s needed to complete the picture is your participation! We hope you will plan to make the trip to Skaneateles and enjoy a special weekend with many friends in the antique boating community. Event information, Finger Lakes Chapter, Antique & Classic Boat Society, www.flc-acbs.org.